It’s no secret that I’ve been working on updating Veil and will soon be releasing Veil 3.0. In the process, I’ve learned quite a bit about Python 2 and 3. Veil-Evasion was developed in Python 2 and after attempting to recreate some of the same capabilities in Python 3, I’ve learned how “loose” Python 2 can be. We were able to get away with various commands where Python 3 explicitly requires us to define what is being done. You can see there is a difference in how the shellcode is being handled. In Python 2, I’m storing the shellcode as a bytearray, vs. Python 3 it’s stored as bytes. This isn’t a huge difference, but a larger change can be seen when manipulating shellcode, such as storing it in a base64 decoding script. PayloadCode += RandT + " = \"" + EncodedShellcode + "\"\n"
PayloadCode += ShellcodeVariableName + " = bytearray(" + RandT + ".decode('base64','strict').decode(\"string_escape\"))\n"
This script decodes the base64 encoded string (the shellcode), and then string escapes the shellcode. After that, the escaped shellcode is injected into memory and run. Python 2 makes this fairly simple to do, Python 3, is a little more strict with the datatypes that are used. Immediately there’s a difference with how shellcode generation and manipulation is handled. In this case, line 2 still receives the shellcode as a string similar to ‘\x41\x7d\x00\x0a…’, but you can’t base64 encode a string in Python 3, it requires input to be in the form of bytes. Unfortunately, .encode() on the shellcode doesn’t properly encode the shellcode for injection later on in the script. It took a while, but with the help of @raikiasec, we were able to figure out that encoding shellcode with latin-1 formatting (.encode(‘latin-1’)) allowed the string shellcode to be properly encoded. The hardest concept for me to grasp was learning the proper encoding/decoding format that the shellcode needs to be in for the different types of manipulation that I would perform on the shellcode (base64 encoding, letter substitution, encryption, etc.). Hopefully by giving some code examples here, this can help anyone else that is looking into using Python 3 to manipulate shellcode, inject it into memory, or more. If there’s a better way to do the above, or if you have any questions, don’t hesitate to send a message my way! Otherwise, be sure to check out Veil 3’s release at NullCon and you’ll have plenty of example to look at! Whether it be through phishing, or some other means, waiting for your incoming beacons can be an anxious moment. Every time I send off phishing e-mails, I anxiously await to receive the incoming beacons. I personally want to know and be alerted the second that I receive a beacon, so I figured this would be a great time to work with Raphael Mudge’s scripting language that’s built right into Cobalt Strike – Aggressor. Aggressor is an event-driven language, very similar to scripts people may have developed for IRC. One of the events built into Aggressor is “beacon_initial“. This event is triggered when a beacon is established for the first time. Using this event, you can have Cobalt Strike do “something” when a beacon first checks in. Aggressor is based on the language Sleep (also by Raphael Mudge) which supports an “exec” function. So to tie this all together, we can have Aggressor run a command when each new beacon first checks in. Sounds like I can just write a script that texts me with some of the information I’m interested in receiving for each new beacon! The Aggressor script can be found here, so let’s go through this and learn what’s happening. The “beacon_initial” is the event that triggers when a beacon first checks in. The “local” commands are used to declare the contained string as a local variable. These will store the internal IP and computer name of the beacon that just checked in. The “beacon_info” commands allows us to retrieve metadata about the incoming beacon, in this case the internal IP and computer name. Finally, the “exec” command executes the script at the location I’ve specified. Now, all that is needed is a script that sends the text messages! This can be easily done using Python, and I have a script here that does it. This script was modified from another script I found online. It uses gmail (you will need to provide a username and password) to send e-mails to addresses that you specify. In this case, it’s sends e-mails to the addresses for AT&T and Verizon that translates e-mails to text messages (just change the phone numbers in the toad variable). 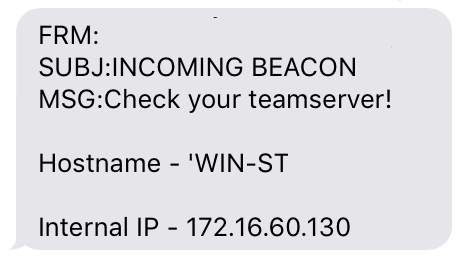 Now, anytime that I receive an incoming beacon, this script is triggered and I receive a text message containing the hostname and internal ip of the compromised system! You can run this one of two ways. While connected to your team server, just load up the Script Console, load your script, and you’re good to go. However, this obviously requires you to stay connected to your team server. Your other option is to use the “agscript” binary that comes with Cobalt Strike. This program lets you connect to a team server and run a script, without requiring the Cobalt Strike client. An easy way to use this is to SSH to your team server, start a screen session, and run the agscript binary in the background with the above Aggressor script. Now, anytime you receive a beacon, your Aggressor script will trigger your e-mail script which texts you to notify you of the new beacon! Since its release, EyeWitness has purely been a passive scanner. 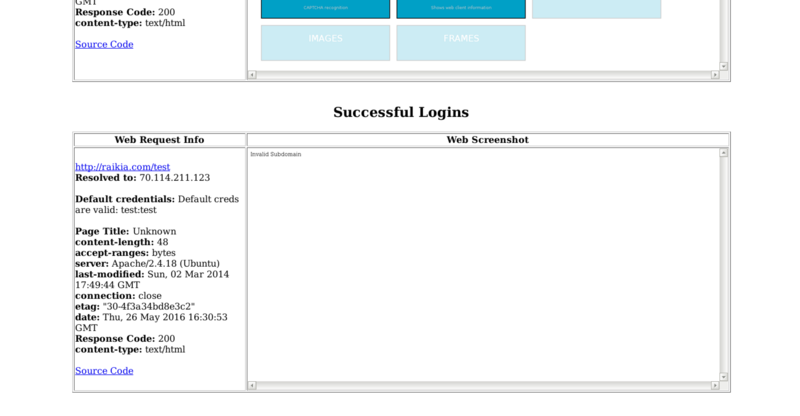 Its focus has been to take screenshots of web applications, and attempt to identify any default credentials that might be associated with that web application. In my experience, it works well to save me the time from having to look up account information. While there are other features, this has been EyeWitness’s primary MO. For a while, it’s been requested that EyeWitness integrate active scanning features to actually test and see what user accounts are genuinely valid, but it’s just never been in EyeWitness’s functionality.. until now. Evan Pena (@Evan_Pena2003) just submitted a pull request to EyeWitness which has just been merged into the master branch. While it is currently limited in scope, active user account scanning functionality has just been merged into EyeWitness! 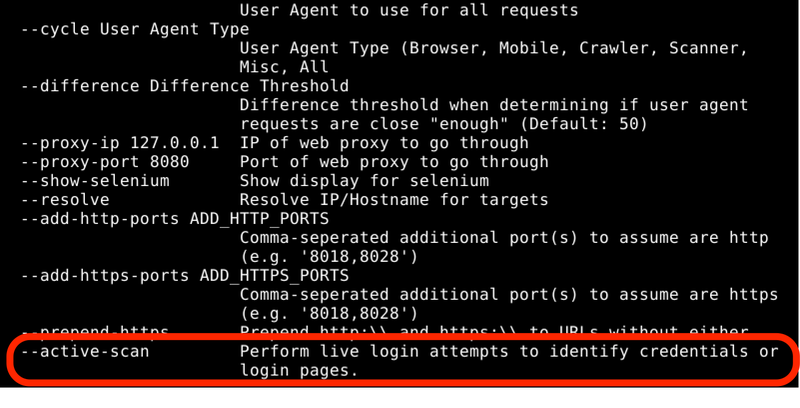 When you use the –active-scan command line flag, EyeWitness will attempt to find common locations of login forms, and if one is found, it will attempt to validate commonly used credentials and see if they work for the specific web application being tested. Additionally, we are now able to create more targeted “signatures” that can be used to specify paths for each unique web application and the credentials that should be tested against it. 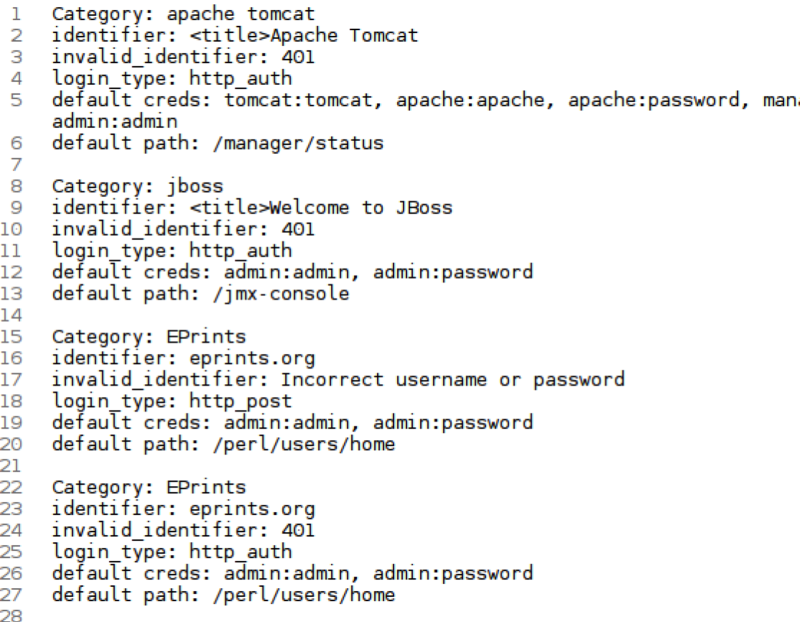 For example, the –active-scan feature now can test tomcat manager web applications with various username and password combinations to see if any are valid. If a valid user/pass combo is found, EyeWitness will not only alert within the console, but the report itself has a new category called “Successful Logins” to highlight the applications where EyeWitness could successfully log into it. As of now, the “database” of web applications isn’t large. However, this is the same situation we were in when EyeWitness began passively scanning for default credentials. As the database is built out, I’ll have the ability to add more web applications in and identify more credentials for each web app. I’m really happy to have had this feature added in from the community, and I look forward to adding to the web application database and identify more credentials with each scan. Since the first release of EyeWitness, the tool has supported input formats of both text files, and XML output from Nessus and Nmap. There’s two main ways to parse XML, the Document Object Model (DOM) and Simple API for XML Parsing (SAX). The main difference is when using DOM to parse XML, the whole XML document is loaded into memory and analyzed. SAX is essentially a stream based parser and loads small pieces of the XML in memory at a time. DOM is faster at parsing XML since the entire file is loaded into memory, but this comes as a memory cost. EyeWitness has always used DOM based parsing since it is faster and I had yet to encounter a failure in parsing due to this design decision. However, I can no longer make that claim. Viss has become my edge case (and I’m now certain that others who perform the same work/scans are as well. Also, I make this claim that he is my edge case jokingly :)). A couple months ago Viss had contacted me to let me know EyeWitness was crashing after trying to parse an XML document. This XML file was the output from (I believe) scanning the whole internet. It was a funny conversation, but showed that I needed to change how EyeWitness parses XML in order to handle these larger scans (I’m talking nearly a gig, I believe, for a single XML file). EyeWitness has now been modified to use SAX-based XML parsing. The tradeoff is that there might be slightly longer XML parsing times, but this will ensure that EyeWitness is able to parse anything you can throw at it (until someone comes with my next edge case :)). The slightly longer parsing times for XML will likely not even be noticeable for nearly all users. This change has now been pushed into the master EyeWitness branch. If you have any questions, don’t hesitate to reach out and ask (@ChrisTruncer). I’m writing this post to hopefully help serve as a reference that documents multiple ways you can move laterally within a network. There’s a bunch of different tools that are built right into Windows which help facilitate lateral movement, how kind of Microsoft :). For now, lets start looking over our options. WMI has become more and more prevalent to red teamers and hackers after Matt Graeber really helped bring out its usefulness at Blackhat. WMI allows you to do so many different things that it would take multiple blog posts to document, however I’ll try to go over the useful things right now. One thing to note: WMI for nearly all cases requires local administrative access on a system, so you will need to be running in the context of a user that has local admin access (or provide the credentials) on the system you are targeting. This command will start notepad.exe on the testwinpc, and you have remote code execution! The ReturnValue of “0” lets us know that it executed successfully. 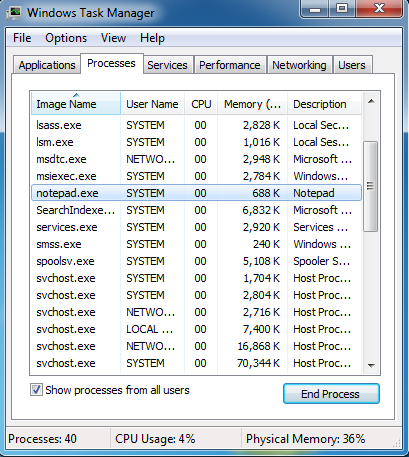 On our target system, we can see notepad.exe is running. This is useful when you may not be able to access a system over SMB, but you can using WMI. Also, WMI is generally a sneakier way (at the moment) of executing code on remote systems as you are not having to drop anything to disk. I can see that my job is job number 2 for this system. Now, when the system hits 11:53 AM, it will run the notepad.exe process. One key difference between using at jobs and WMI is WMI runs in the context of the account you provided. At jobs run as system. Creating the job was successful, and we can see our job was assigned JobID 3. WinRM is a very nifty way to execute PowerShell code on a remote system. As with the previous options, it will require that you have local administrative rights on the system you are targeting. If WinRM is enabled on the system you are targeting, you can execute PowerShell commands on the target, giving you the flexibility of PowerShell. The ports that you would probably see WinRM listening on is 5985 (http), or 5986 (https) (source). Raphael Mudge has a great post on using WinRM. Be sure to check it out! I don’t think I really need to go into any sort of description for this :). Remote desktop is useful on servers where you can connect remotely without interrupting a users session. RDPing into someone’s workstation can cause issues, and can be easily detected. I wouldn’t recommend RDPing into a workstation unless it’s not being used at all. I hope this helps to document a couple of tools built into Windows which helps to facilitate lateral movement within a network. By no means is this an all-inclusive list, but a start. If there’s something else you think is worth calling out in this post, please be sure to let me know! After it’s initial release, I’ve had some feedback which has led to additional functionality within WMIOps, and I’ll be pushing it out in this WMIOps 1.1 release. This release is fairly minor with two functions being added in, and an enhancement to an existing one. Invoke-FileTransferOverWMI – This now has an “Execute” switch that can be provided on the command line. If used, once a file has been uploaded to your target machine, the function will use WMI to execute/run the uploaded file. This is now a different way to get code execution on a remote system vs. Invoke-CreateShareandExecute. Over the past year or two, I think everyone has seen an increasing use of WMI by attackers everywhere. WMI is very interesting medium for carry out various actions across hosts on a network. While for the most use cases you will need local administrative rights, once obtained you can easily query, search, and compromise remote machines all over WMI. Matt Graeber spoke about using WMI for C2 at Blackhat and really sparked my interest. He then went on to release Invoke-WmiCommand which is a proof of concept script for executing powershell on a remote system and using WMI for its C2 channel. After learning a lot about how he implemented this, I decided to play around with WMI and see what actions I can do on remote systems over WMI and started working on WMIOps. Invoke-ExecCommandWMI – This function will run any command you give it on the targeted system. This will not return output of the command to the console. Invoke-KillProcessWMI – This function is used to kill a process on a remote system via process ID or process name on the targeted system. 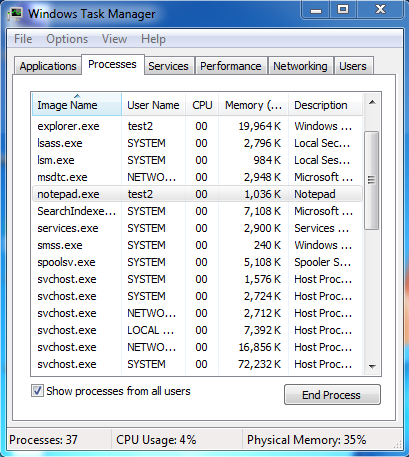 Get-RunningProcessesWMI – This function will return all running processes on the targeted machine. Get-ProcessOwnersWMI – This function will return every user account that has a process running on the targeted system. Find-ActiveUsersWMI – This function will attempt to determine if a user is currently active at the targeted system. This works by checking to see if LogonUi.exe or a screen saver is currently running on the remote system. If either process is running, I am assuming the user is not currently at their desktop. 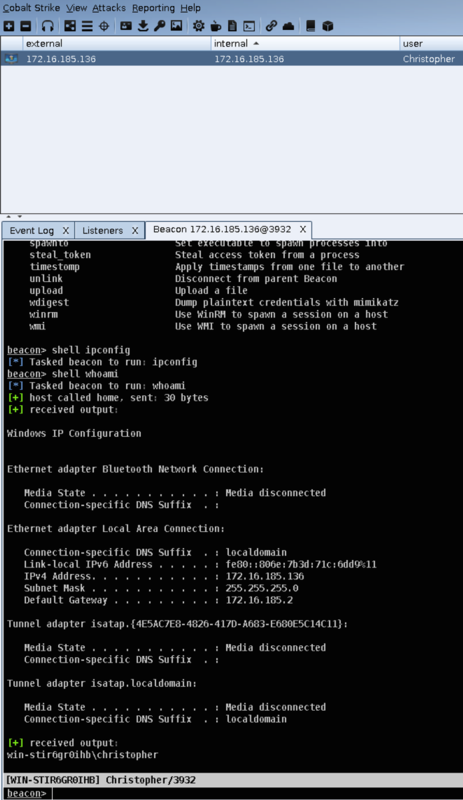 Invoke-CreateShareandExecute – This function creates a network share on the local host. A user-specified file is then copied into the share and permissions are set for both the file and the share to be accessible by Everyone. Next, the function uses WMI to call/run the user specified file on the target machine and runs the file via UNC path. This needs to be run from an elevated command/powershell prompt. Invoke-RemoteScriptWithOutput – This function uses WMI to spawn powershell on a remote machine to download a user-specified powershell script (downloaded using IEX cradle), run the script and post back the function’s/script’s output over HTTPS to a user controlled server. Find-UserSpecifiedFileWMI – This function takes a filename or extension and searches for the location of the file(s) on the remote system. The path, along with additional information, is returned for any file(s) found matching the search string. Invoke-FileTransferOverWMI – This function uses WMI to upload or download a file from the local system to the target system. For uploads, the function reads the local file, base64 encodes it, and stores it in the local registry. It then uses WMI to spawn powershell on the targeted system which connects back to the local system, reads registry value, base64 decodes it, and then writes it to a user specified location on the target system’s disk. This is essentially my first script I’ve developed in powershell, and I certainly expect to have many “learning moments” on more proper methods of developing these same functions in powershell, so please let me know if I’ve developed something improperly. Finally, I wouldn’t have been able to write this without the work of multiple other people who’s work I referenced throughout the writing of this script. Matt Graeber, Chris Campbell, Will Schroeder, Evan Pena, Justin Warner, Matt Nelson, and Chris Ross‘s powershell work served as great references for how to write in powershell, and for working with WMI in powershell. Thanks for all your guys work and ability to release it for others to use and reference. I’ve been monitoring the logs from the Veil-Evasion and this website, and I noticed the past couple days that there’s a lot of attempts to log in to the Veil website. Seeing as I am not logging into it myself, I know that this is obviously going to be someone trying to break in. However, this isn’t an attack where the attacker is trying to remain under the radar, this is pretty blatant. Short story, the attacker appears to be coming out of Russia. Note: This doesn’t mean it’s a Russian attacker, just that the IP space they are attacking from appears to be Russian. It’s an issue we all encounter, we’re operating in a shell and want to upgrade it to something better. For many, this may be Meterpreter which is absolutely a valid choice. Another option I want to explore in this post is upgrading your shell to a Cobalt Strike Beacon. In this instance, I’m going to cheat by generating a shell callback with Veil-Evasion to simulate operating in a shell and executing it on a VM. Now that I have my shell, it’s time to look into upgrading this to something better! 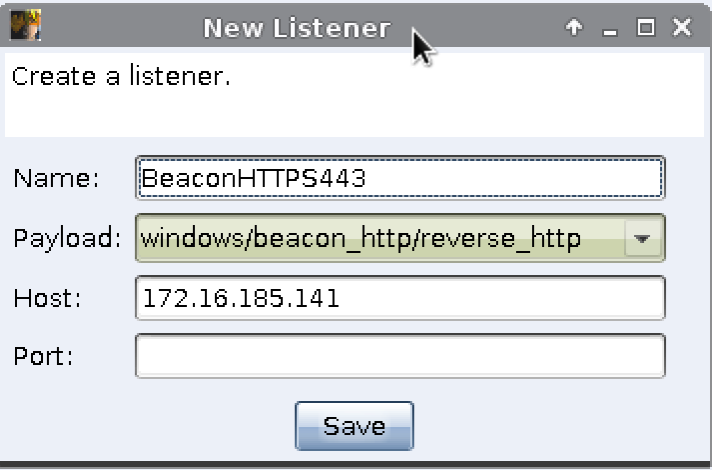 First, I’ll need to setup a Beacon listener within Cobalt Strike. This is pretty simple, just select the headphones icon on the top menu and you’ll be presented with the Listener tab. Just select the “Add” button at the bottom and configure your listener as you see fit. Once you’ve created your listener, it’s time to prep for the shell upgrade. 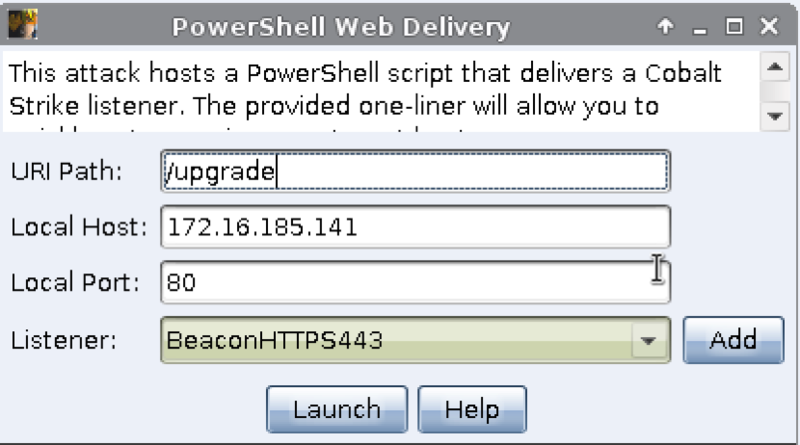 I prefer to use Cobalt Strike’s powershell web-delivery feature to upgrade my shell. To set this up, click the powershell icon on the top menu and configure the attack. In this case, I customized the uri to be “upgrade”, I am using the default port 80, and the listener that I want to utilize was pre-selected. Now, just select launch, and you’ll be given the command that you can run on your victim machine. All you need to do now is just copy and paste this command into your shell, and you should see your beacon calling back! If you have any questions, be sure to let me know! Hop in #Veil on Freenode or hit me up on twitter @ChrisTruncer.